Slice meat into about 1/4″ thick strips (or have your butcher do it for you ahead of time) and trim all fat. Combine all ingredients to make your marinade. Marinade strips, leave in bowl, cover and let marinate in the fridge for as long as you prefer. Tried this one out, and the wife and I both agree it’s very good. Yup yup, tried this one, added about 1 tbs of brown sugar and sprinkled with pepper after marinating. 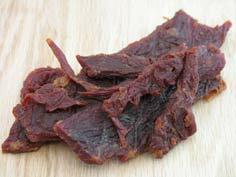 Really good, mild tasting jerky.